We send out a monthly email newsletter - sign up here! Wonderful woodlanders with spring flowers and good foliage at almost any time of year. 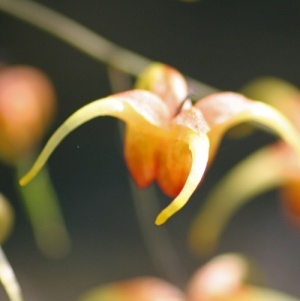 Some incredibly tough plants that look incredibly dainty and a few that do need cossetting. 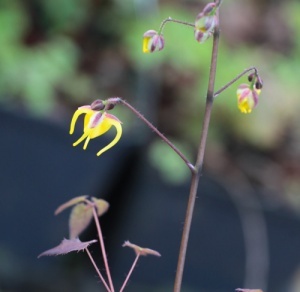 Many view Epimedium as dull, Victorian, shade plants but following the many recent introductions from Asia in recent years and the inevitable raft of hybrids that have occurred in cultivation since they are anything but dull now. 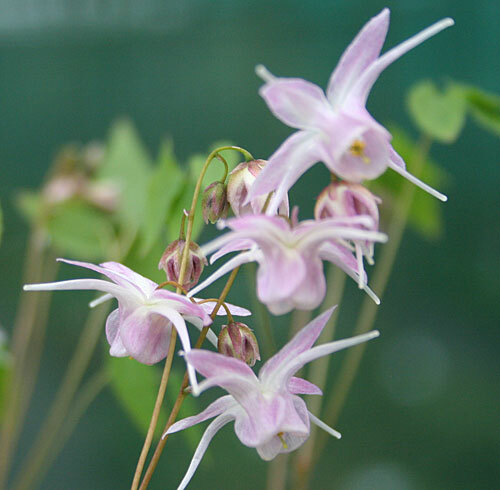 Many of the new introductions have brought a range of interesting foliage shapes as well as some amazing flower types including long spurred and clouds of tiny flowers. 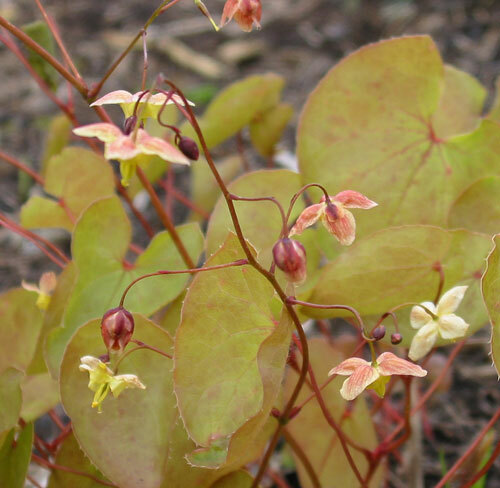 Most forms of Epimedium are easy to grow in a shady border requiring little more than a decent, humusy soil that doesn't dry out too much in summer. The older deciduous and semi-deciduous types do benefit from having the previous year's foliage sheared off in late winter to display the spring flowers but do not be tempted to cut back the evergreen foliage of the new Asian types in the same way, they have a habit of dropping dead if you do! 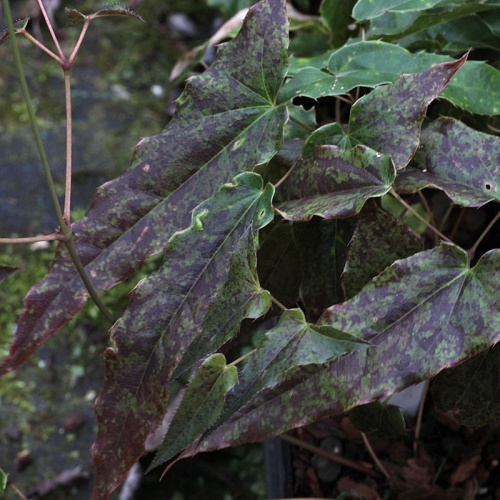 Clumps of large foliage, mid green in summer and deep blackish in winter. Sprays of light yellow flowers to 45cm in spring. Good soil in shade. 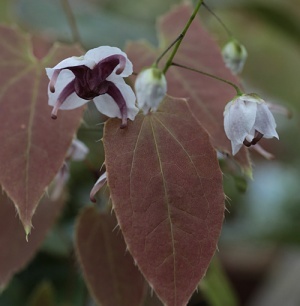 A cracking long-spurred E. grandiflorum x E. koreanum hybrid with rich purple pink flowers with pale, almost white spurs. Flowers up to 4cm across in spring. Deciduous. 25cm. Good woodland soil in shade. A new hybrid from Spinners. 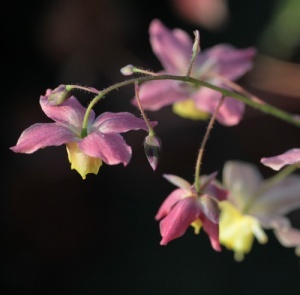 The long spurred, spidery, flowers are an undescribable pale greenish buff-pink! Evergreen here so don't cut it back, the flowers and new foliage will appear just above the old in spring. Good leafy soil in shade. 30cm. 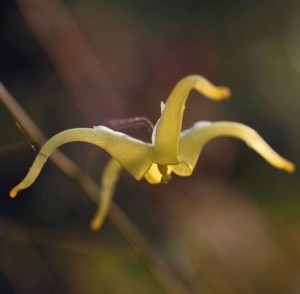 A compact species with box shaped flowers of bright, clear yellow and tough toothed leaves. Often good rusty-red autumn/winter foliage. 30cm. Good soil in shade. 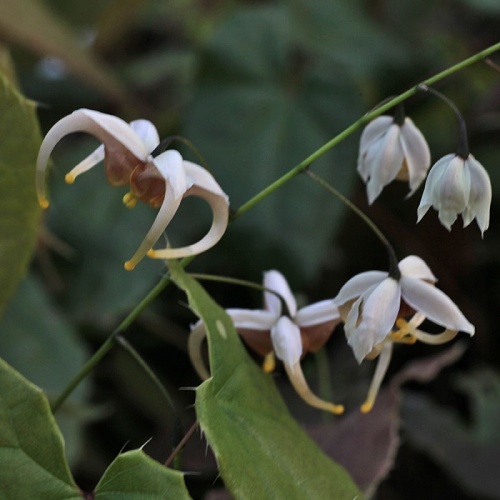 Found in Hunan, China in 1994 this lovely, rare species has short stems bearing sprays of largish (up to 3cm) flowers, this sepals white and the petals a rich purple-brown. Slowly creeping clumps to perhaps 15cm high. Good woodland soil in shade. Large spidery flowers of a greenish yellow. Evergreen, 40cm. Good soil in shade. Pretty palest pink flowers in generous sprays in spring. 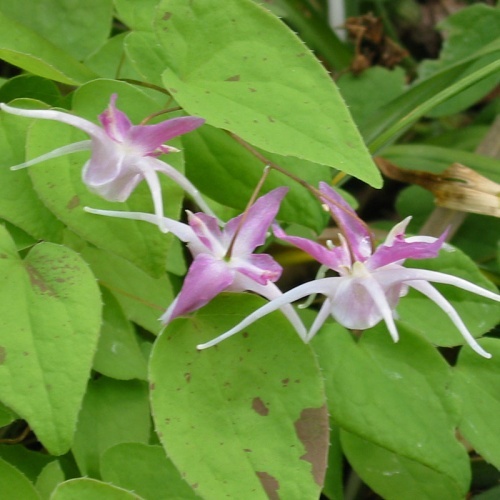 Red-purple margins to the deciduous foliage. Neat clumps to 30cm for good soil in shade. 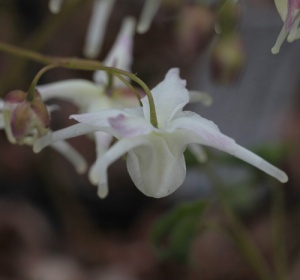 One of the best white flowered Epimediums, this neat clump forming cultivar is semi-evergreen with good autumn foliage. Sprays of chunky white flowers in spring to 40cm. Average to good soil in shade. A stunning long-spurred species relatively recently introduced. Semi-evergreen textured leaves are long and pointed, sprays of large pale pink flowers in spring to 30cm. Good woodland soil in shade. A recent introduction from China, this species has almost prickly evergreen foliage and very large, long spurred, light yellow flowers in late spring. Good soil in shade. 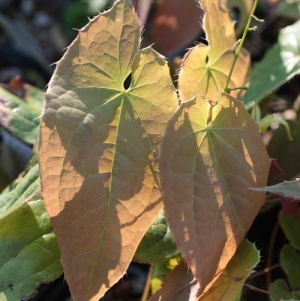 New foliage is stunning with reddish patches on coppery green leaves. A striking Chinese species making good clumps of narrow jagged leaves and tall stems with masses of long-spurred pale yellow flowers potentially to 1m but normally 60cm. Good soil in shade. Difficult to describe as the flower colour varies considerably from sun to shade! 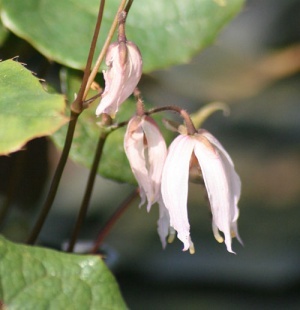 In shade it is a dull brown-purple, in sun rich reddish fading to yellow spur tips. Big flowers to 4.5cm across on stems to 45cm. Good soil in shade. Very attractive rusty red markings on light green new leaves in spring with pinkish red and light lemon yellow flowers to 30cm. Stunning! Ordinary soil in shade. 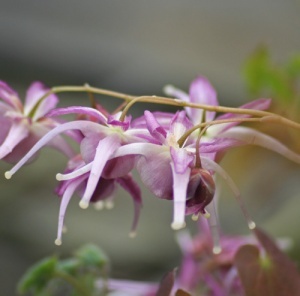 Small clumps of delicate looking leaves with purple edging and sprays of box shaped flowers of a deep purple in mid spring. 25cm.